Heat the pan and dry fry the cumin seed and redchilli for a minute. Reserve some tadka for garnishing at the end. Now add olive oil to the same pan with cumin seed and chilli. Add grated carrot when the oil become hot. Fry for few minutes and add yellow lentils to it. Now add vegetable stock until lentil immerse or according to your consistency. Bring to boil and simmer for 15 minutes until dal is cooked. Alternatively,dal can be cooked before and simmer for 5 minutes. Cool the dal mixture and blend it well until smooth. Now add reserved tadka,corianderleaves and yogurt for garnishing. 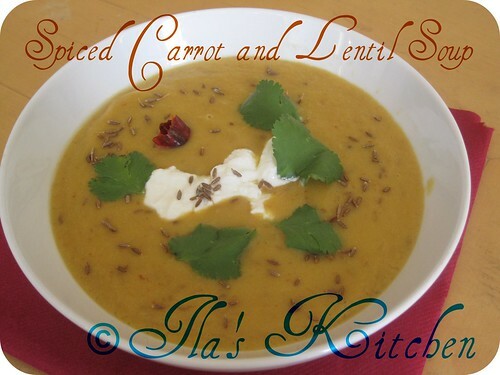 Carrot and Lentil Soup is ready to serve. 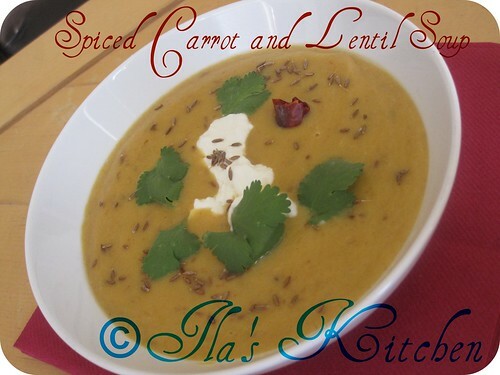 This yummy and healthy Carrot and Lentil Soup can be served for evening refreshment. Glad you could join us again Ila. Soup looks very inviting. Wat a wonderful looking soup,i wont mind to have this soup for my dinner..
That sounds delicious...and very hearty! Very nice and healthy one Ila. Yummy soup! It looks great and awesome! Healthy n filling- looks so thick n tasty..
Soup looks dleicious and healthy. so refreshing and healthy soup !! The ingredients in the soup made it very healthy.. looks colorful..
Mmmmmm ... Delicious & healthy soup! Looks tempting!! !